Each state has unique commercial painting licensing laws, specialty classifications, and application requirements. Businesses must be aware of specific jurisdictional requirements before they start operating in a state including basic business licenses, and payroll registrations in addition to painting specific licenses. In most states a commercial painter is required to obtain a general contractor’s license with a specialty classification in painting. This type of license may require an examination by the qualifying party, a surety bond, proof of insurance, financial statements, letters of reference, and proof of experience. In Arizona, commercial painters must obtain the general contractor license with the C-34 Painting and Wall Covering specialty. This license requires each contractor to pass the general business law exam and a trade exam specifically tailored to this specialty. In Florida, commercial painters may either register with each individual county in Florida or obtain the state-wide general contractor license. The state-wide license has exam and experience requirements. Some states do not require a license but may require registration with the Secretary of State and/or licenses on the local level. Painters are subject to basic business licenses like any other business. 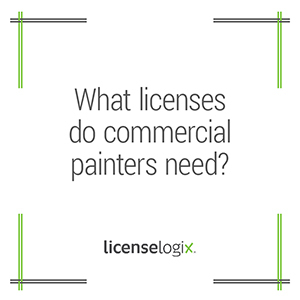 LicenseLogix will help commercial painters obtain all of the licenses and registrations required, minimizing time-consuming and costly delays. If you are already licensed, we can file renewals and manage ongoing compliance. For additional help you can fill in the form on the right or give us a call at (800) 292-0909.